Small kitchens present unique challenges for homeowners, but having a small kitchen doesn’t mean you have to resort to takeout every night. Here are 5 easy ideas for small kitchens that will help make your space look and feel larger. Space-permitting, bring in any storage pieces that will fit in your small kitchen. A kitchen hutch, set of drawers, rolling island or hanging pot rack are all great ways to squeeze in extra kitchen storage. 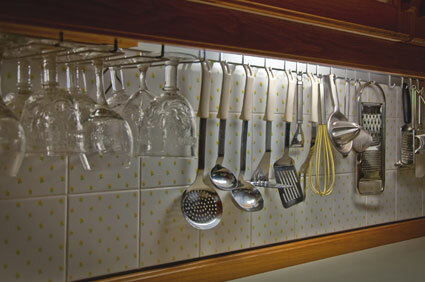 If you have free wall space, consider adding open shelving or wall organizers for storing smaller kitchen utensils. 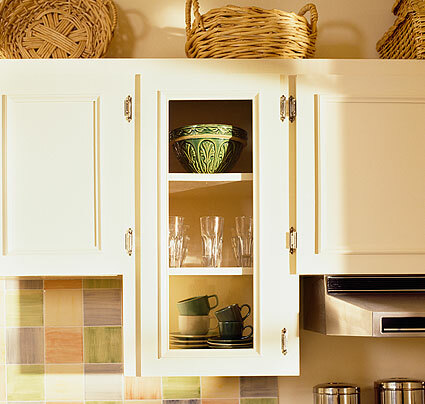 If your cabinets don’t reach all the way up to the ceiling, make use of above cabinet space with baskets and bins. If you don’t have room to bring extra storage in, use your oven as additional storage when not in use to store large baking sheets, pots, and pans and clear up space in your cabinets for other items. Just be sure to empty it out before you use it. One of the best ways to cut down on clutter and make room for the things you use the most is to edit the items in your kitchen. 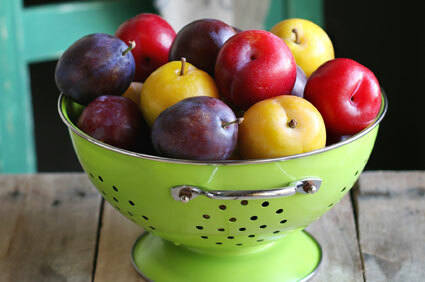 Do you have a small kitchen appliance you use less than three times a year? Consider donating it or gifting it to a friend who might make more use of it. When shopping for your kitchen consider looking for things that serve multiple purposes like a blender that can also be used as a food processor, or a colander that coordinates with your décor and doubles as a fruit basket. To make your small kitchen appear larger, use light, neutral colors. Stick to slightly varying shades of a single color that you choose. This will give your kitchen a monochrome look which will help it appear larger by blurring distinctions between cabinet, wall and appliances. Camouflaged appliances (appliances with cabinet front appearances) will help achieve this look too. Ceiling treatments and statement lighting can help draw the eye up, to make the room seem larger. Keep the ceiling in the same color family as your walls and cabinets but consider adding a little texture or trim to add depth. Keep lighting fixtures on the smaller side and look for clean, simple designs. 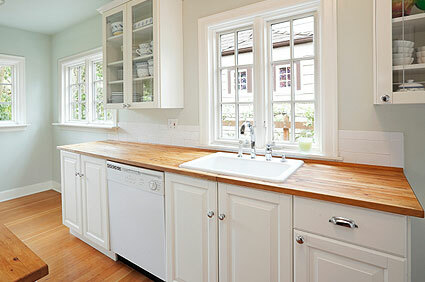 Open up a wall or go for glass front cabinets. 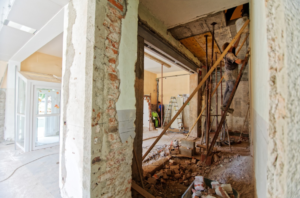 Extend small kitchens by removing a non-load bearing wall. For extra seating and storage replace it with a peninsula or an island. 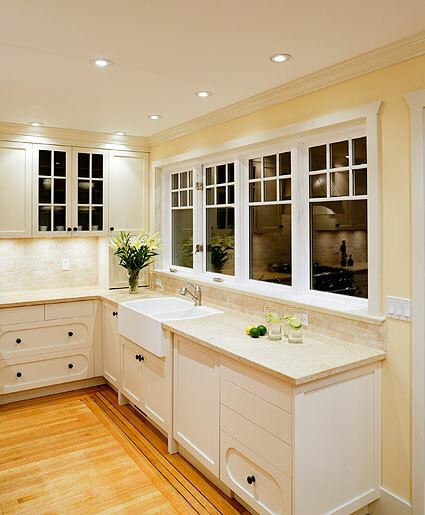 Even opening up a “window” in a wall that faces additional living space can make your kitchen look and appear larger. If opening up a wall is not an option, try incorporating glass front cabinets or replacing a wall of cabinets with open shelving. The exposed look helps open up the space and doubles as a great way to display your favorite kitchen items. Casey Makovich is a Copywriter at Riverbend Home, an online source featuring the latest popular home styles and products at a variety of price points to make sure you get the look you love and keep you on the cutting edge of home technology.